Tags: casino jackpot, Golden Gate casino, Las Vegas, Wisconsin. This week, one female tourist in Las Vegas will definitely remember her visit very fondly as she managed to hit the jackpot prize on a slot machine at the Golden Gate Hotel & Casino in Downtown Las Vegas. 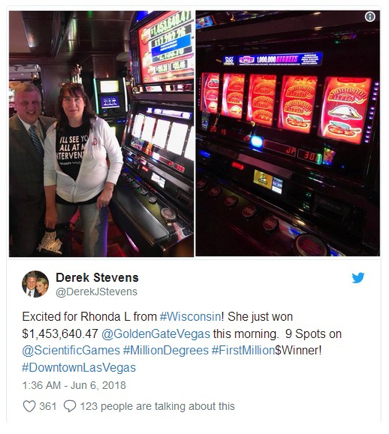 The photo above shows Derek Stevens, the owner of the Golden Gate casino in downtown Las Vegas, and Rhonda L. of Wisconsin right after she won a slot machine jackpot worth $1,453,640 on June 5, 2018 (Tuesday). Derek Stevens, the casino owner, first announced the wonderful news on Twitter, writing that the largest jackpot in his career just happened. The lucky winner was simply named Rhonda L. from Wisconsin, and the winning machine is called 1,000,000 Degrees from Scientific Games. 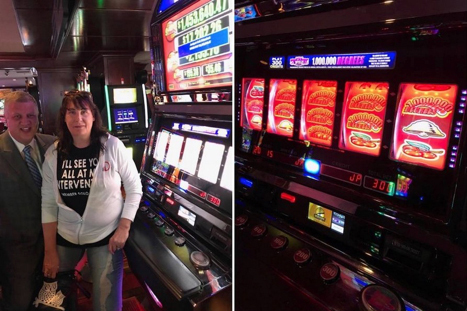 She got 9 spots on the reels to win the $1,453,640.47 jackpot prize. 14 comments for "Las Vegas Tourist hits $1.4 Million Jackpot on Casino Slot Machine"
well that's certainly a day she will remember very fondly of, of course if she is not robber on the way home or beaten by a bunch of degens just because she has won and they have not... anyways, back to the topic- 1.4 millions of dollaros is a significant amount to cash to collect for like 99% of dudes and dudettes in the world. Very lucky this woman. Most of gamblers who play, dream of winning a jackpot but as we know this will never happen to them. It's fantastic to win such a big prize and it will remain for Rhonda L. of Wisconsin a very beautiful story. 9 spots on the reels to arrange yourself for many years. Being a tourist hitting a jackpot like that. There is no doubt that this would be her best trip ever. Going into a casino with a few bucks, getting out with a fortune. this can happen only to somebody who is there like tourist and who want to try luck because its vegas!and its good that money goes to somebody who have normal life and now it can be changed!its good that you can see photo of owner and winner! It could have been a local winning the jackpot. You think they are picking the winners, rewarding them the jackpot? How many times have we tried in a real casino to win something big. 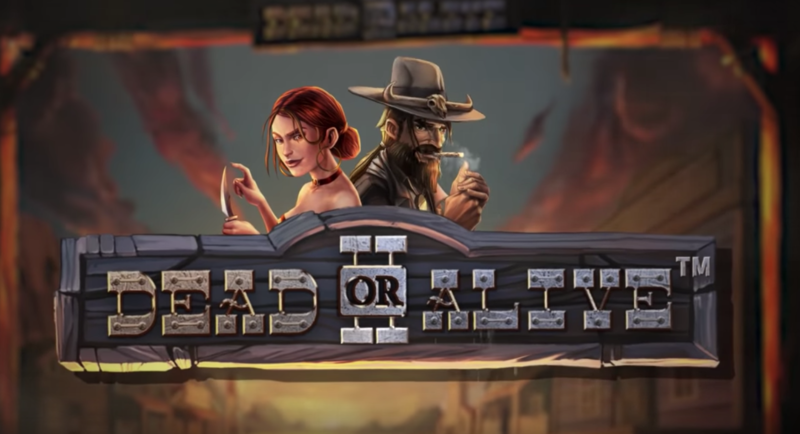 you can imagine her face when she got all this symbols at screen!you must get so many of them,to get jackpot,so when you see 3 or 4,you can be happy,but to hit 9 of them is just crazy!dont know what was bet for this spin,but it was luck to her! Woww, what a prize! I don´t know how many time (and chips) she had to take, but it´s really amortized! I don´t like the slots. No, they don´t like me! I love their moves, and color and songs...but they don´t give me anything. Really, I like them so much that I could make a picture withe the screen of the slot machine and hung it in my room! I do not even like the slots but this year i noticed something about them. To win, you must be able to play these slots. You have to look here in the bankrollmob and see that they are free slot games. You have to look here where he writes - Useful Links - with red color and after that - Play Slots For Free - also in red write. Good luck my friend with these games and i hope you learn something good. Absolutely gigantic congratulations to Rhonda on hitting the jackpot worth US$1.4 million! Her family, friends, and colleagues must be so happy. I stayed at Golden Gate Casino for a couple of nights back in the early 2000s. I think its room rate was $14 or $15 plus tax per night.